Judging by the police sheets, that daily chronicle of urban jungle transgressions compiled for the media by most police forces, knives seem to be back in vogue -- much easier to conceal than guns, up close and personal, noiseless of course, and definitely bad-assed scary in tight quarters. There are all sorts of knives -- stilettos, switchblades, speed locks, flicks, front loaders, butterflies and Bucks. But, despite their effectiveness, knives don't tend to make the news like the loud bang of guns do -- which is one reason why Leeds-Grenville Tory MP Gord Brown likely got short shrift with a private member's bill seeking to have mandatory minimum sentences handed down to killers who wield knives. 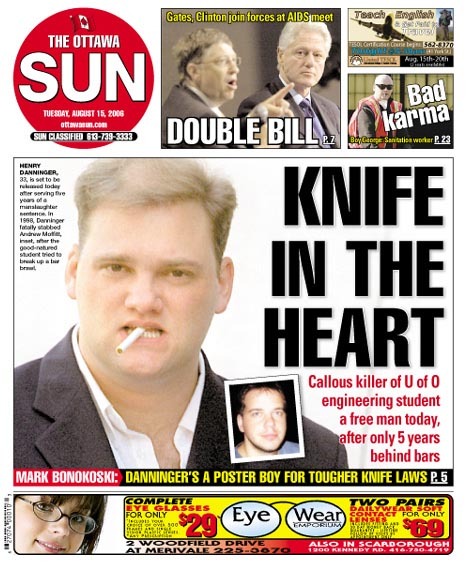 "Knife 'nicked' man's heart," reads one recent headline harvested from this newspaper's archives. And then the library's computer punched out 67 other knifing stories from its memory bank, with none of them old enough to be considered outside the trend. Henry Danninger once had a "bad-assed knife." It was his description of the weapon that he drove through the heart of Andrew Moffitt, a high-achieving engineering student at the University of Ottawa who, as a reward for stepping into a barroom fracas that was not of his making, was posthumously awarded the Governor General's Award for Bravery. If there were ever a poster boy for Brown's private member's bill for tougher knife laws, Henry Danninger would be that boy. Not only was Danninger from Brockville, the St. Lawrence Seaway town that's the focal point of Brown's federal riding, so was the young man he killed -- even though their lives had never crossed paths until that night in an Ottawa tavern when Danninger went to settle a drug score and shanked an innocent bystander. Sometime today, following the signing of some paperwork, the gates will open at Bath Institution, the medium-security prison west of Kingston, and Henry Danninger will walk out into the forecasted sunshine. If whoever picks him up happens to take the scenic route back to Brockville, along the Thousand Islands Pkwy. and then along Hwy. 2, they will eventually drive past the St. Francis Xavier Roman Catholic Cemetery. That's where Andy Moffitt is today. He went to that cemetery at the age of 23, and will remain there forever, never getting a day older. Not so Henry Danninger. He got older while serving his five years in prison after finally copping a guilty plea to manslaughter in the stabbing death of Moffitt in late 1998. However, as Danninger told the NPB hearing I attended in Kingston last year, the one in which his bid for early parole was denied, prison made him healthy. "Surprisingly, I have a better life here," he told the NPB tribunal, comparing his days in prison to his time under house arrest at his parents' home in Brockville awaiting trial. "I've lost 80 pounds, and I don't smoke," he said. The NPB has no choice but to cut Danninger loose today. As of this morning, he will have served two-thirds of his sentence and has therefore reached his statutory release date. According to the statutory-release documents obtained by the Sun, the former drug-dealing Danninger must abstain from drugs, must stay out of bars and taverns, and must not associate with known criminals. That's the only real tether on Danninger until his "warrant" totally expires on April 25, 2008 and his debt to society is supposedly paid in full for the loss of Andy Moffitt. He must also avoid any direct or indirect contact with his victim's family, a tough row to hoe considering he will be moving back to the same town where the Moffitts live. "My worst nightmare is bumping into Henry Danninger in a mall," says Paulette Moffitt, Andy's mother. "And it is bound to happen. Brockville is small." Back when Danninger was under house arrest, and Brockville police could somehow not nab the sicko who was dumping urine and feces on his car, Darryl Amoroso decided to become his own private eye. He installed a small surveillance camera in his yard -- at his own expense -- and then sat back to see who he would capture in the act. It was, of course, none other than Henry Danninger whose house arrest awaiting trial had by then grown to three years, so slow is the justice system. Darryl Amoroso's backyard camera caught Danninger on tape, not once or twice, but on 24 separate occasions. The assaults occurred virtually every night. Urine over the car, feces in the driveway, sardines on the doorstep. After Amoroso turned his tapes over to the Brockville police, Danninger's bail was yanked for breach of conditions, and he was once again behind bars. All that ends today when Henry Danninger -- the poster boy for tougher knife laws -- walks out of Bath Institution, with all the days necessary for statutory release having been served, including the two-for-one credit he got for his months of in-house custody, as well as the time he spent tossing urine and feces on his neighbour's car. While he is still almost three years shy of being totally untethered from his parole conditions, Danninger will nonetheless be on the sunny side of the sod if the scenic route home is taken past St. Francis Xavier Cemetery. The same cannot be said for Andy Moffitt.